I hope these colors show up better on your computers than mine. Even with my photo box I still get some sicky lighting on my photos. The colors are brown, pink, soft yellow. This is one of the pads of paper that I received from one of my friends when she rearranged her office and craft room. Love to be on the receiving end of those kind of projects. 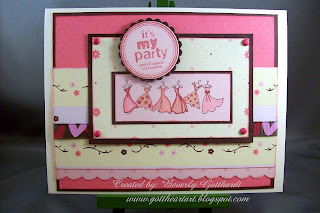 Creative Card Crew Let's Get Cute and Girlie! Supplies: Cream Card Blank 5" X 6 1/2" The Paper Studio, Papers: Chatterbox Inc.-Olive Garden Plaid, Making Memories-Cosmopolitan Collection, Stamps: Stampin Up-Simply Sweet, Itty Bitty Backgrounds, Hampton Art-Happy Birthday, Ink: CTMH-Z2111 Chocolate, Hollyhock, Stampin Up-Blushing Bride, CTMH marker-Hollyhock, PrismaColor Pencils, Sansodor Low Odour Solvent, Spellbinders Nestabilities-Classic Scallop Circle Lg., Fiskars-Scallop Sentiment border punch, Stampin Up-1 1/2" circle punch, small pink brads unknown, ribbon-Am. Crafts, pop dots. Gorgeous card Beverly! The colors look good. Thanks for playing along with us at Operation Write Home! Love how you did the saying. Gorgeous card!! Thanks for joining us at the Creative Card Crew. Great job on your card Bev. I like the colors and paper that you used. Thank you so much for playing along with us at The Sweet Stop Sketch Challenge and we hope to see you back tomorrow! Great take on the Sweet Stop sketch Beverly! Super cute and so pretty in pink! Glad you could join us for the challenge this week! Absolutely love your card and I can think of several nieces who would adore it! Cute party dresses! Very nice card! Super adorable card!! The patterned paper is very cute!